I would like to take this opportunity and tell you all that a movie is being made on KUVEMPU by Rithwik Simha, S/o Veteran Actor, theatre Personality C.R.Simha. This movie is about the life of kuvempu. It shows kuvempu’s childhood days, youth, middle aged and aged kuvempu. This movie has 6 songs all written by kuvempu and sung my Shimoga Subbanna, RK Shrikanthan, Rajesh Krishnan, Vijay Prasad, Hemanth and Real Star Upendra!!! Songs have come out really good!! Most of the actors in this movie are from Theatre background!! For most of them, it’s a debut project. There are 4 Dances too. Shooting will start from 3rd November 2008 at Mysore and will complete this project by December end and should be ready to release by January 2009!! This movie is surely going to be a masterpiece!! At the end, I would like to share with you all that I am also a part of this project and it gives me immense pleasure to be a part of such a great project. Mysore, Nov. 3 (KCU&RK)-Shooting of the Kannada movie Rasarushi Kuvempu, based on the life story of Rashtrakavi began this morning at the writer’s home Udayaravi in V.V. Mohalla. The movie is being produced by Aravind and Padmaprakash and directed by Rithvik Simha, son of noted artiste C.R. Simha. Dialogues are scripted by Dr. H.S. 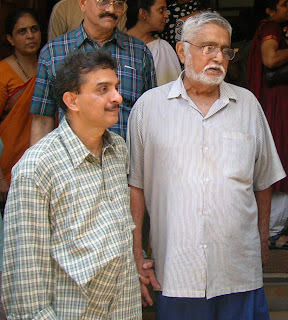 Venkateshmurthy and C.R. Simha. V. Manohar has scored the music with six songs picked up from Kuvempu’s works including an English song, according to Manohar. Kuvempu, in his younger days, will be portrayed by Harish of Prabhat artistes and during his older days by C.R. Simha. The movie is likely to be completed in just one month to be shot in Mysore, Theerthalli and Bangalore. Kuvempu’s wife late Hemavathi would be portrayed by Padmaja Srinivas. The muhurat shot of C.R. Simha offering puja to a portrait of Ramakrishna Paramahamsa was picturised this morning with Dr. K. Chidanandagowda, former Vice-Chancellor of Kuvempu University and son-in-law of Kuvempu, clapping the board. Litterateurs Prof. D. Javaregowda, Malali Vasanthkumar, Tharini (Kuvempu’s daughter) and K. Vijaya Kumar, former Joint Director, Information Department, were present. Veteran actor-director C.R.Simha will do the role of Rashtrakavi Kuvempu on celluloid. Veteran actor and director C.R.Simha, who had immortalized Rashtrakavi (National Poet) Kuvempu in the play ‘Rasarishi’, is all set to play Kuvempu once again, on celluloid. Kuvempu, who has been widely regarded as the greatest poet of 20th century Kannada literature and is the first one among the seven recipients of Jnanapeeth Award for Kannada, will be brought alive on screen for the first time. While C.R.Simha is playing the role of Kuvempu in the film ‘Rasarishi Kuvempu’, his son Ritwik Simha will be directing the same. Ritwik says the film would be completely different from the play. “There are no similarities between the play and the film. It will be a biographical film, where we can see the growth of Kuvempu from an ordinary man to a National Poet”, says Ritwik Simha. Ritwik also cautions that his film is not at all an art cinema. “Though it is a biographical film, it is definitely not an art film. To be precise, it is a music based film. There are six songs and seven bits in the film and V.Manohar has given the music”, adds Ritwik. The film is being produced by Aravind of Enterprise Entertainment and stars Harish, Padmaja Srinivas, Nanda Kishore, and Neeta in lead roles. The film will be shot in Mysore and Theerthahalli. Mysore: A film is now being made on poet Kuvempu (K.V. Puttappa). Ritwik Simha, director, is all set to portray the life, work and vision of the Rashtrakavi on celluloid. Widely regarded as the greatest poet of 20th century Kannada literature, Kuvempu is the first among the seven recipients of Jnanpith award for Kannada work. He is the second among Kannada poets to be revered as Rashtrakavi after Manjeshwara Govinda Pai. He is well-known for some of his phrases and in particular for his contribution to universal humanism. It is significant that C.R. Simha, theatre and cine artiste, has been staging Rasa Rishi, a one-man play which takes viewers through the different stages of Kuvempu’s life. Now his son, Ritwik Simha, is shouldering the responsibility of making a film on Kuvempu with the same title with his father in the lead role. It is not easy to make a film on Kuvempu whose multi-dimensional persona is so much a part of the Kannadiga’s psyche. It is a challenging proposition. It is also significant that except an attempt by Gnana Rajashekharan who has immortalised Subrahmanya Bharati in Tamil, no one has tried to portray the life of a poet on celluloid. Shooting for the film commenced on Monday at Udayaravi, Kuvempu’s residence, in Jayalakshmipuram here. Speaking to The Hindu, Ritwik Simha said that he decided to make the film inspired mostly by Attenborough’s Gandhi, Ketan Mehta’s Sardar Patel and Shyam Benegal’s Subhas Chandra Bose. He and his father started working on the script five years ago. “Though it is difficult to bring the grandeur and the epic quality of Gandhi, it is possible to inculcate that film’s spirit. It is a biographical film which deals with how Putta, a young boy of Kuppalli, transformed into Rashtrakavi Kuvempu. The film is set in the period between 1910 and 1990,” he said. Basavaraj wields the camera, poet H.S. Venkatesh Murthy and the senior Simha have penned the dialogues. The director is making use of Kuvempu’s poems extensively in the film. He is planning to shoot the film in Kuppalli, the native place of the poet, and in and around Tirthahalli, and various locations in Mysore, where Kuvempu lived for a long time. Portions of Kuvempu’s plays Jalagaara and Smashana Kurukshetra will be used in the film. The contemporaries of Kuvempu will also figure in it. Master Anil and Harish will don the roles of Kuvempu in his childhood and as a young man in the film, respectively. “To make the film authentic it has been decided to cast newcomers, especially those with a theatre background,” the director said. Shimoga Subbanna, Rajesh Krishnan, R.K. Padmanabha, Vijaya Prakash and Hemanth will sing for the film. Actor Upendra will also lend his peculiar voice. “We have decided to compose new tunes for Kuvempu poems to make them effective,” said Manohar who has scored the music. Initially, the film will be made in Kannada. It will be released with sub-titles in other parts of the country and abroad later. “After Kuvempu’s demise, and when I was staging Rasa Rishi, his daughter, Tarini, invited me to Udayaravi and handed over her father’s clothes to me. I am using them in the film. I am proud of playing the role of a humanitarian,” said the director’s father. Ritwik Simha clarified that the film has no resemblance to Rasa Rishi. It is just a genesis for the film. He said that it is not an art film but a big-budget commercial film and will be released in theatres by February 2009. Bangalore: Rasarishi Kuvempu, a feature film on K V Puttappa (Kuvempu), noted poet and the first recipient of the Jnanpith award in Kannada, will hit the screens after Sankranthi next year. Directed by Ritwik Simha, son of noted Kannada artiste C R Simha, the movie captures the life, works and message of Kuvempu for the present generation, which knows little about him. “The film is a journey of Kuvempu from his birthplace in Kuppalli in Thirthahalli to Mysore, where he studied and brought out the best of his literary works,” says Ritwik, who has already completed the first schedule at Kuvempu’s house in Vontikoppal in Mysore. Ritwik has involved poet H S Venkatesha Murthy, vocalist R K Padmanabha, theatre artistes Padmaja Srinivasa, Harish, Anil, M S Vidya and Neetha for various roles and songs. Jasleen Simha has designed the costumes, with Basavaraj behind the camera. Ritwik has selected six songs, all penned by Kuvempu, for which V Manohar has scored the music. Kukkarahalli Tank, Junior BA hall in Maharaja College, the table and chair used by the poet to write Sri Ramayana Darshanam, which won the Jnanpith, a car used by him and places that influenced him form part of the movie. C R Simha wears a jubba-pyjama once used by Kuvempu. It was presented to him in 1995 by Indukala Surendra, the poet’s daughter, after appreciating his play Rasarishi, which even Kuvempu had not seen. She gave it to Simha in 1995. “It is a greatest treasure I have,” says Simha. Super Star Upendra has sung the song Bommanahalliya Kindarijogi… penned by the poet for the lead character. He has already made name by rendering his voice to Chitrana, chitrana… for his latest hit Buddhivantha. Though he is a son of a great actor and theatre personality C.R.Simha, Rithwik Simha has carved a niche for himself in kannada Theatre. He has at least 40 plays to his credit which he has penned down!! and has translated some 20 plays. I know Rithwik from past one and half years but i have heard about him a lot as my wife, Archana is associated with his troupe “Vedike Foundation” from 10 years!. Rithwik is a soft, calm personality and a great intellectual. Reading books is his favorite job. He has read thousands of books. My wife, when she was doing her final B.Com, she was to participate in her college Drama competition. then she asked Rithwik to direct her a play and also she wanted the play to be a new one. Then, Rithwik was so busy as his team was about to go to Dubai in few days and hence he was busy with getting visa things done for his team members. Even in that tight schedule, he wrote a play called “Nirase.Com”, which became so popular that it has seen more than 50 shows so far!!! I admire Rithwik very much. He is like a guru for me. He gave me a major character in his new play called “Eight Fifteen (8/15)”, which was selected as one of the best plays at the 2007 Natakotsava held at Ravindra Kalakshetra. We also staged this in Mumbai. even this play was penned down by Rithwik himself in just 12 days time. But he has taken 8 years to think about this and has done a lot of research works regarding “Sufi”. This is a must watch. I also owe a lot to Rithwik as he has given me a character to play in this movie. I hope this movie gets good response from Think-Tanks and all classes of people in our society. He is not making this movie for any award nor we are expecting this to be a huge hit among “MASSES” but we need people to watch this movie once and make this a success. Subject: Re: PLEASE read this and comment- IS THIS OK to send ??? We need to know what MICROSOFT is doing on Kannada Language and what MS has done so far. Most of Kannadigas are all in dark. Just MS announcing release of KANNADA LANUGUAGE LIP product without Kannadigas knowledge is not good for MS. Now since few weeks you have been getting emails from Kannadigas who are concerned and who are supporting EKAVI in making sure the Kannada Language Development goes in the right direction. Kannadigas hope that MS can accomadate these things by forming a committee of Kannadigas which consists of Dr. Kambara, Dr. Tejasvi, Dr. Venkatasubbaiah, Dr. Halemane and others. This will also help MS in further developing the Kannada Language Software Development. There are so many unanswered questions are there now. Let us get them solved right away. It is easy as far as we are all open in discussing the issues. Kannadigas hope you understand the gravity of the situation and act on it properly. As I told you before there are some Uiversities are coming forward to take up KANNADA Language Software Development. This will also help MS. Kannadigas wants Kannada language to be developed in a systematic and planned way. Majority of Kannadigas in Karnataka State are using WINDOWS 98. Many publishers and other institutions have invested huge amount of money on win 98 based Kannada programs. If you do not provide compatibility to win 98 they will be permanently struck in win 98. Even from commercial and marketing point of view providing compatibility is important. MS needs to look into the existing base of computers and start from there. Kannadigas wants to find out what solution is provide by by MS for this. Kannadigas wants to find out from MS whether it can help in providing a font renderer for Opentype fonts in Windows 98 with Unicode. Kannadigas wants to find out from MS whether it can help in a Font manager for rendering Unicode on Windows 98 and Linux using Truetype fonts. Kannadigas wants to find out from MS whether MS can help in having Multiple keyboard layout support like Typewriter, Inscript apart from the GOK standard and Development of aesthetic Kannada fonts in both Truetype and Opentype in Kannada. EKAVI is involved in the issues of KANNADA on Computers. EKAVI activities are supported by following Kannadigas. · Drama, Theatre, writing literary criticism, Column writing in news papers. Dr. L. Kale Gowda at CIIL Educational Qualification: Ph.D.(Linguistics); M.A. (Kannada); M.A. (English); Diploma in Folklore; Diploma in Journalism; Hindi Pragya; Certificate Course in Tamil; Computer Course in DOS, Wordstar, Windows 98, Leap Office etc. Kannadigas need to get all the information on things that are being developed by MS. Lots of things are not known to KANNADIGAS.